Kimberly grew up in Southern California thinking sports “weren’t for her.” It wasn’t until adulthood that she tried CrossFit and realized sports are for EVERYBODY. 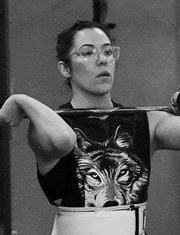 In 2017 she was introduced to Olympic Weightlifting and fell in love with the barbell. She placed second in her weight class in Washington State’s first Women’s Weightlifting Championship. She earned her USAW L1 Certification in 2018. In her free time she loves spending time with her husband and kids, exploring the great outdoors, volunteering at church, and eating more than you think she does. Kimberly is passionate about sharing her love of weightlifting with athletes of all experience levels.